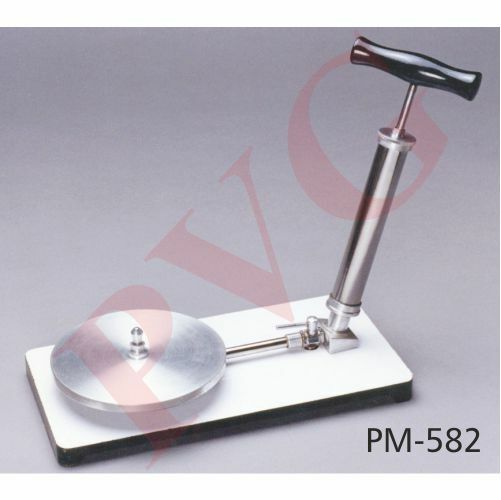 For measurement of heights and setting of slopes and falls. 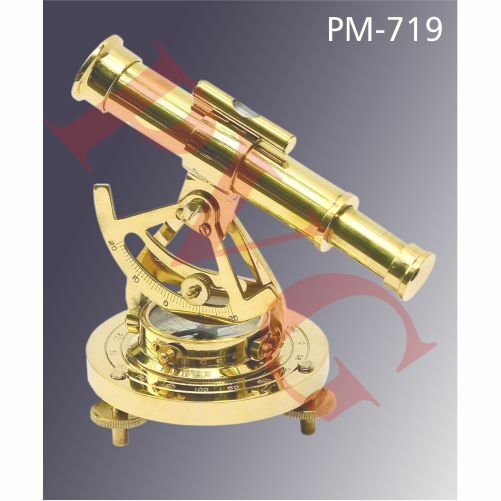 Polished brass arc 74 mm. 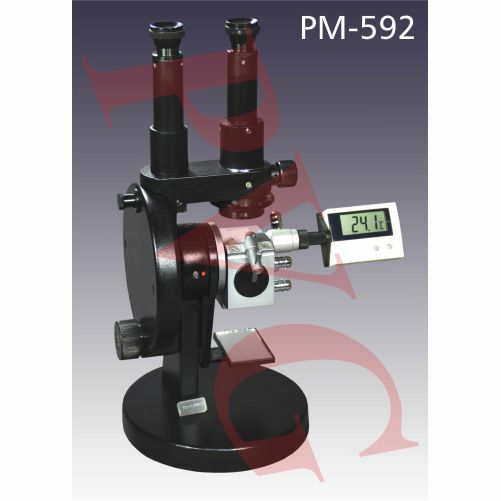 diameter divided 90-0-90°C with vernier scale reading to 10 min. of arc operated by knurled knob which also carries the spirit level. Gradient scale 0-10 x 1. With a magnifier lens for easy viewing of scale. 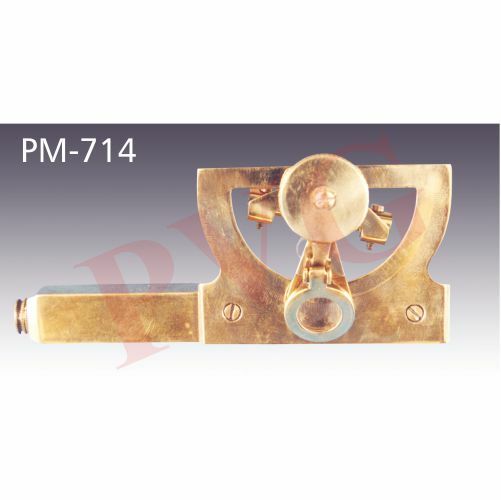 Sighting tube of square-section brass 125 mm. long. Glass, with a riffled inlet tubular at the bottom. Cat. No. Height x diameter mm. As above but with 34/35 ground in stopper and stopcock. 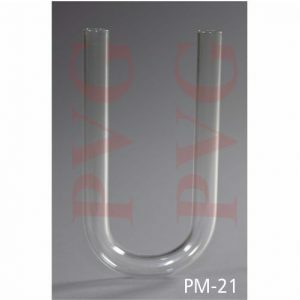 Glass with inlet and outlet tubes, with ground in key stoppers when rotated opens or close the oulet tube, height up to outlet tube 125 mm., diameter 32 mm. and capacity 100 ml. 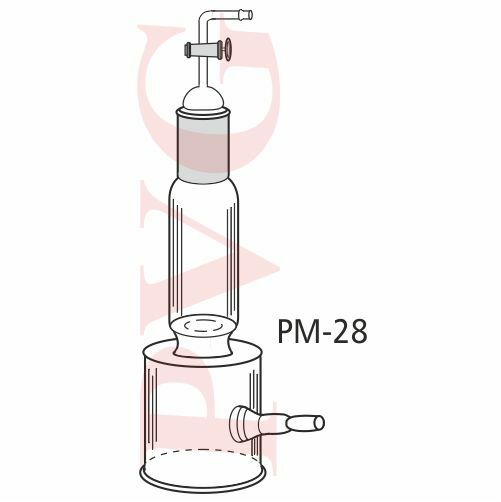 Glass, with one bulb, size height x diameter mm. Glass, with side tubes, closed by hollow ground in glass stoppers which when rotated can open or close the side tubes. Size of U-tube excluding stopper, length x diameter mm. 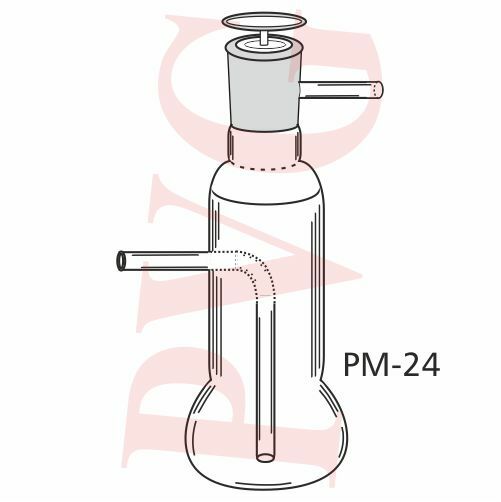 Glass, with inlet and outlet tube at the top, ground in stopper when rotated opens or block the inlet and outlet tubes. An external tube takes the gas to the bottom. Overall size:125 x 30 mm. 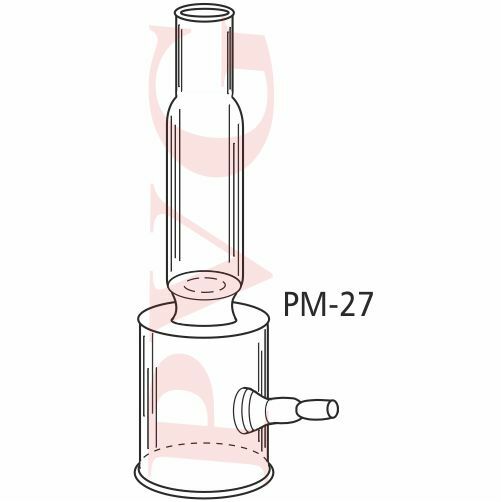 Glass, size height x diameter mm. Glass, thick walls and with side arms, size as above. Glass, height 110 mm., two main bulbs with inlet and outlet, three small bulbs with inlet and outlet attached to the main bulbs. For connecting rubber tubing of different diameters. floroethylene tape, provides an effective seal on all type of materials such as stainless steel, copper, brass, aluminium, plastic, ceramic etc. 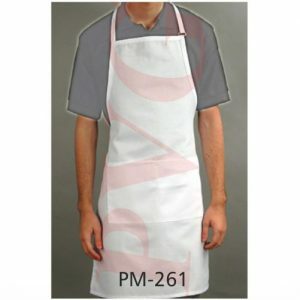 ; resistant to medium including oils, solvents, water, steam, gases, strong alkalies, acids etc. ; can be used over a wide temperature range of -150o C to +250o C; chemically inert so protects fluid against contamination. Excellent electrical insulation property of the tape prevents electric conduction and saves pipes from electric erosion. Requires no drying thus making joints ready for immediate use. Having unlimited shelf life so can be stored easily and indefinitely without loss of properties. Length 10 meter. 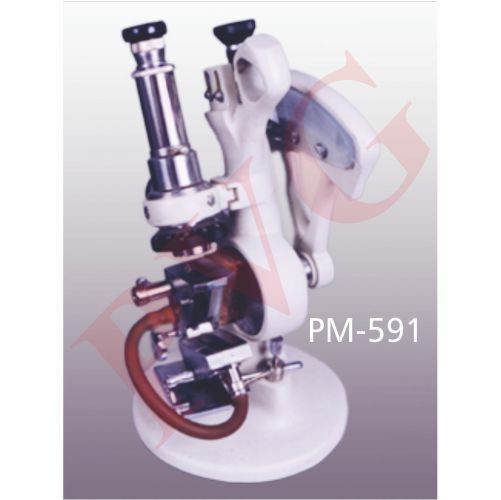 In phosphate finish or chrome plated, angled, one jaw adjustable by means of square cut screw, maximum opening jaw up to 20 mm. 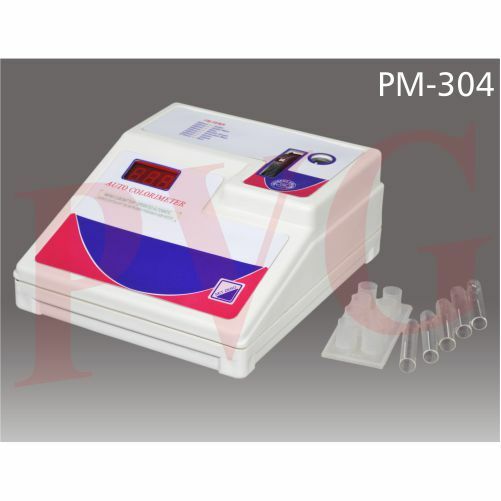 A simple single action vacuum pump for use where very high degrees of vacuum are not required. 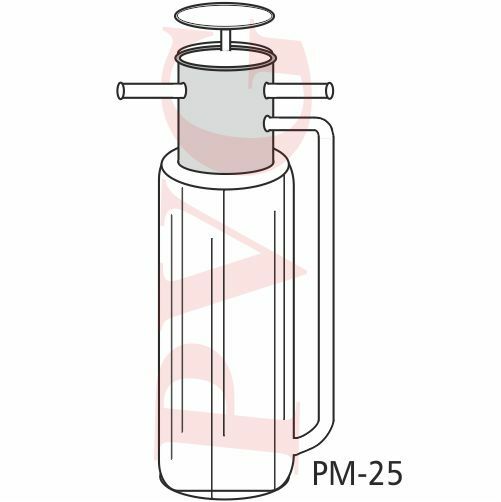 Comprises an air pump (PM 487) with ground bell jar plate of 200 mm. diameter. The plate provided with a riffled inlet nozzle and a stopcock for air regulation. 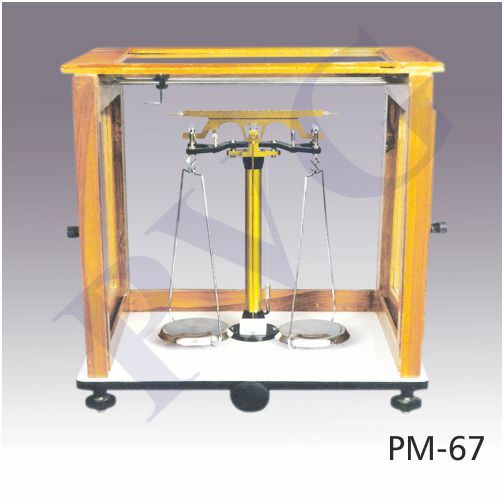 The complete apparatus is mounted on wooden base of size 350 x 210 mm., provided with four rubber feet. 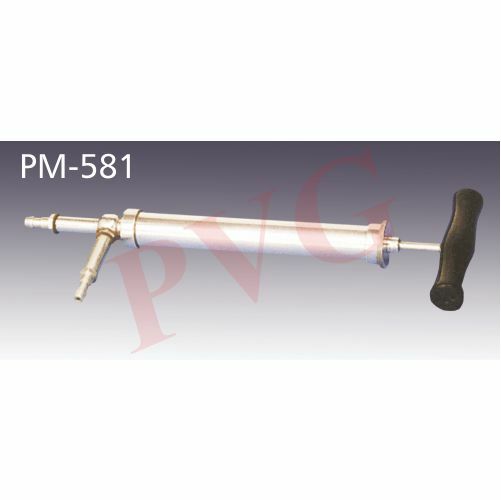 Used as pressure pump, metal body of size 325 x 30 length x diameter, with a wooden handle at the rear end and riffled nozzle of 9 mm. diameter at front end. 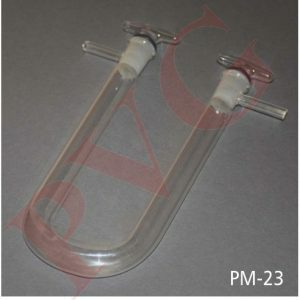 A Simple hand operated syringe type, dual purpose air pump which can be used either to exhaust or compress. The metal cylinder is of size 185 x 32 mm. length x diameter. 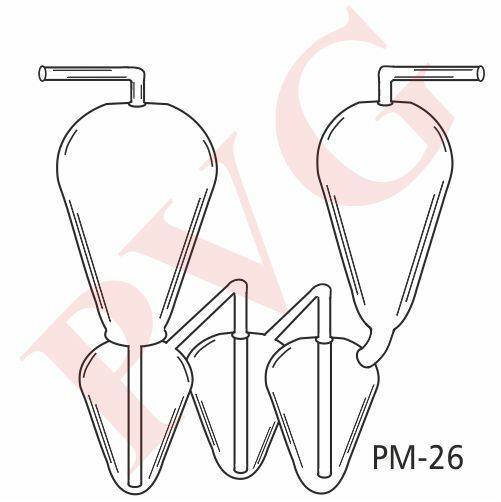 Two oiled valves are provided, outlet valve mounted axially and the end of cylinder and inlet valve radially at the side. 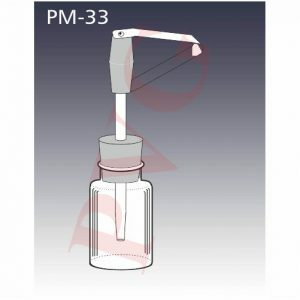 With an adapter for the connection of rubber pressure tubing which can be screwed on to either the inlet or the outlet valve depending on whether the pump is used to exhaust or compress. With wooden handle at the rear end and two riffled nozzle of 9 mm. diameter. Overall length of the pump when fully closed is 325 mm. and width including the side mounted valve assembly is 110 mm. Wooden 37 cm. long divided every 1/10 in., brass sights and spirit level. 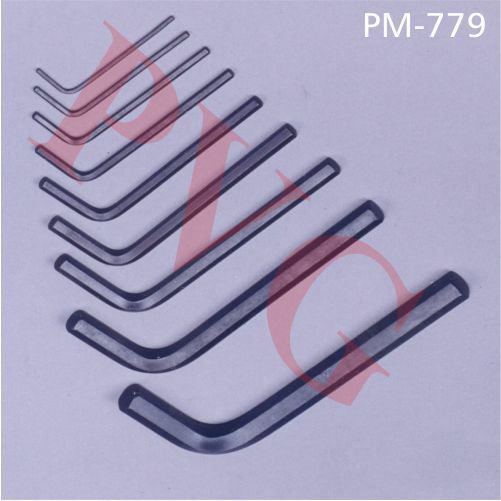 Set of nine, in plastic wallet, size 1.5 mm to 10 mm. Made of 99.8% pure, recrystallized aluminum oxide for high resistance to chemical attack. 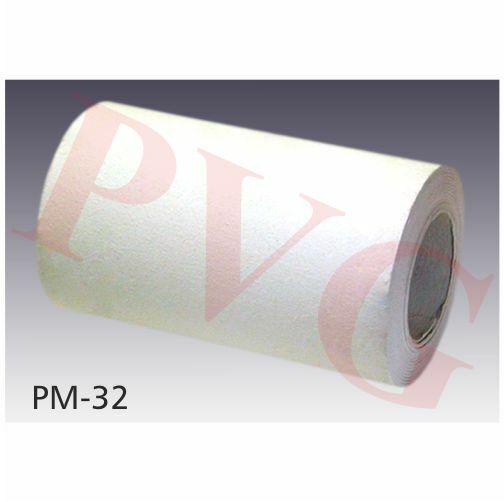 For use in reducing and oxidizing atmospheres and refractory metals (such as molybdenum, platinum, rhodium, tungsten, tantalum, and iridium). Maximum use temperature (no load): 1,750 °C. 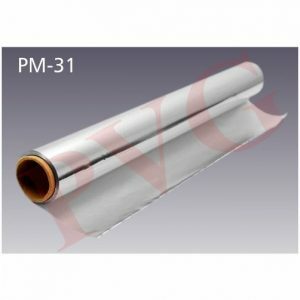 For sealing bottles, tubes, leaks or as a cover to reduce heat losses. 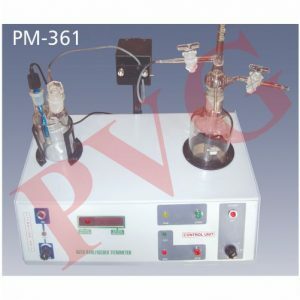 Consist of and three hydrogen mounted on a wooden base. 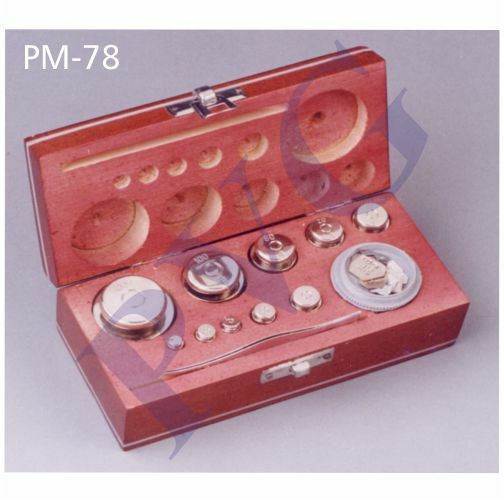 Screwed in type of accurate polished brass masses, arranged as 1- 2- 2 – 5 system packed in wooden box with hinged lid along with fractions 1-500 mg. and a brass forceps of length 90 mm. 1-500 gm. is with two additional 200 gm. masses. 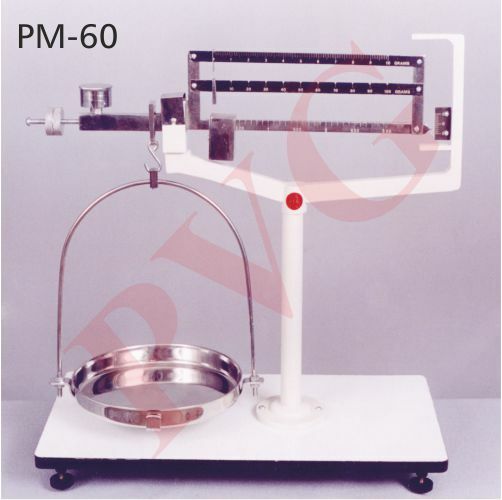 Nickel plated mild steel, jaws flat and bent at 90o for picking up small objects like spheres, crystals etc. Length 200 mm. White or colored with bib. 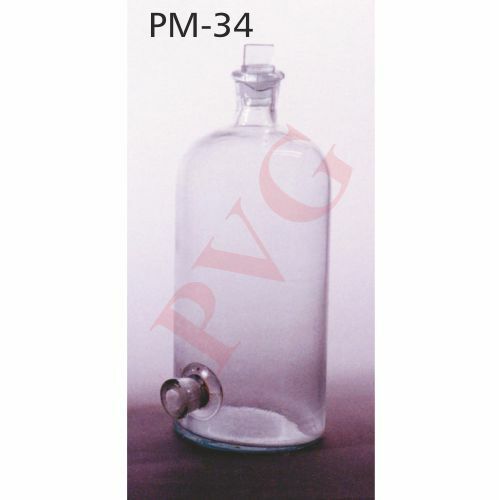 Rubber stoppered glass bottle of capacity 125 ml. , with a 200 mm. long, 6 mm. 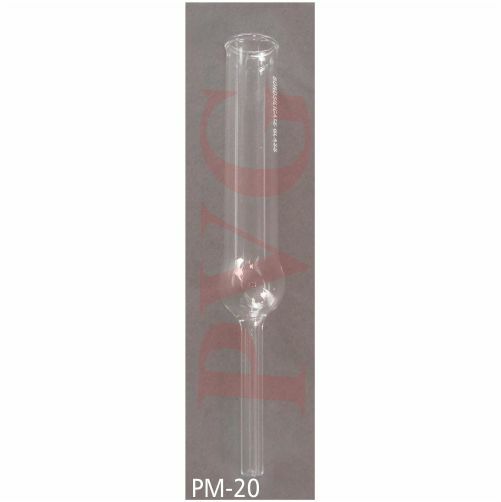 diameter glass tube made into a jet at one end, inside hole size 2 mm., two rubber stoppers with holes of 6 mm. diameter held by a nickel plated spring clip. Grey colored paper in packing of 70 sheets in each roll. Size of each sheet 121 x 110 cm with thickness 1.2 mm. Cat. No. Width x Length mm. Cat.No. Capacity ml. Pack Qty. 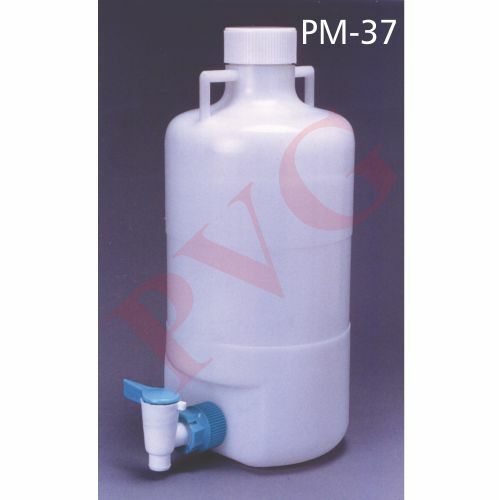 High density plastic, with large bore polythene tap, screw on plastic cap, integral moulded handle. Polypropylene, light weight, autoclavable, durable. The leaker proof spigot screwed at the bottle body requires only a half turn to open or close. 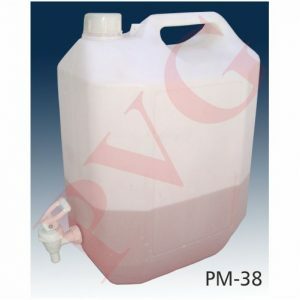 Used for storing or dispensing distilled water & other laboratory solutions. Threads should be totally disengaged before autoclaving. Moulded soda glass with ground in stoppers and tubular. Cat.No. Capacity liter Pack Qty. With plain neck or with stopper, size same as above. 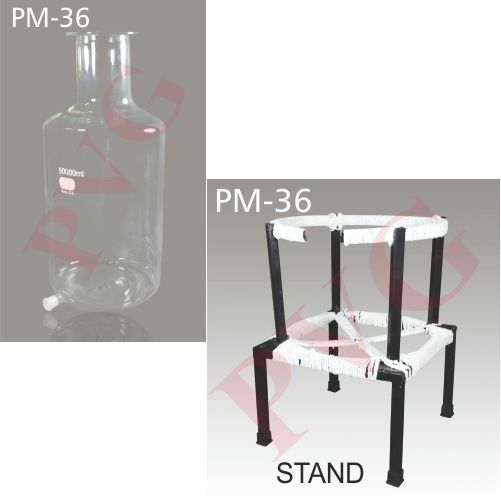 ASPIRATOR STAND: 20 & 50 Litres are supplied with metal stand having rubber feet. Complete controll by the PC. Enabled with integrated floated optical platform design which improves the optical system shock resistance. 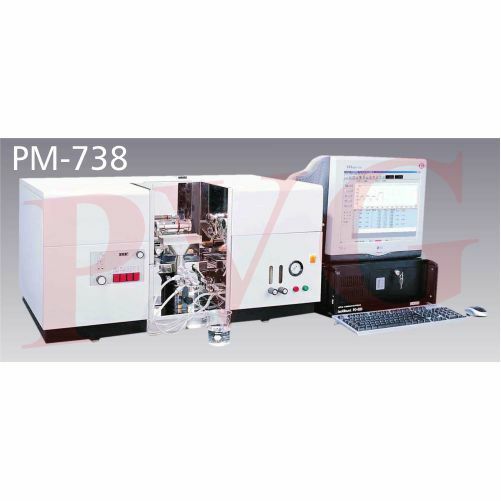 Fully automated wavelength scanning and peak searching which make them highly suitable for data processing and data interpretation from the database. Contain more than 500 data self storage and cut-off storage function. Have capacity to store the analyzed result with the form of excel and the results can be randomly called. 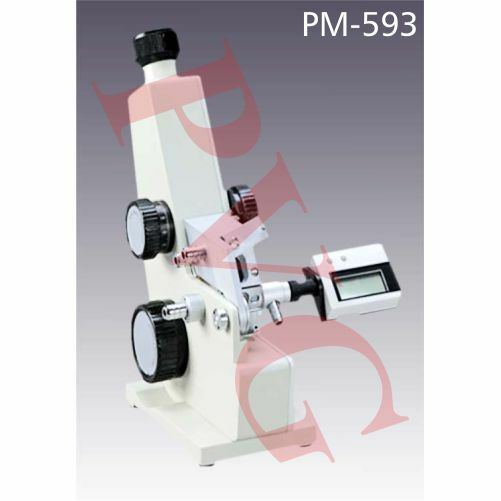 With unique features like excellent measuring methods, position adjusting and result printing methods. 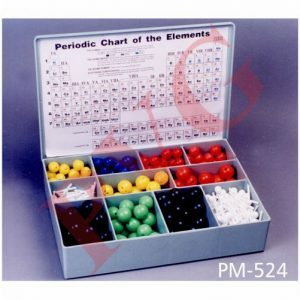 This set comprises of 75 balls of different colors and size with 35 flexible connecting white links. 12 black balls, diameter 25 mm., four holes, represent Carbon. 4 Yellow balls, diameter 25 mm., four holes represent Sulphur. 5 green balls, diameter 25 mm., one hole represent Chlorine. 4 orange balls, diameter 25 mm., one hole represent Sodium. 26 white balls, diameter 12 mm., lugs 50mm represent Hydrogen. 37 white connectors of three lengths represent Valency bonds. 6 orange balls, diameter 19 mm., two holes represent Calcium. 6 red balls, diameter 19 mm., two holes represent Oxygen. 6 blue balls, diameter 19 mm., three with three holes and three with five holes represent Phosphorous. 6 yellow balls, diameter 19 mm., two holes represent Trivalent metals eg. Aluminium, Chromium etc. Supplied packed in a plastic box with different compartments. The most instructive and exceedingly useful set for students. 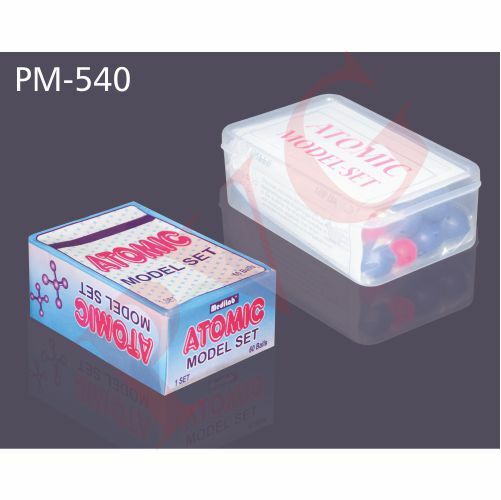 Set contains 60 different coloured plastic Balls in a plastic box. The balls represent various elements. 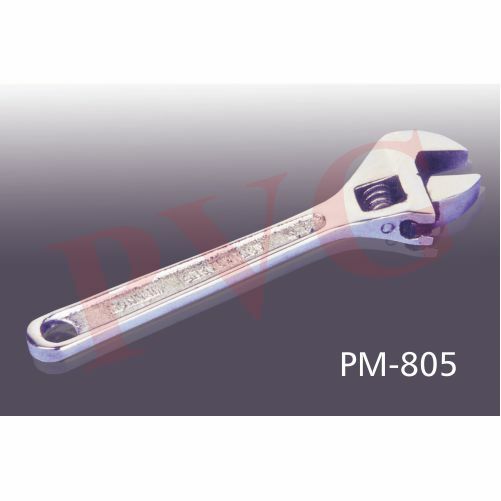 A packed of polythene linkage is also supplied with each set. 15 Large size black balls with 4 holes representing Carbon, 5 Large size blue balls with 4 holes representing Nitrogen, 6 medium size red balls with 2 holes representing Oxygen, 4 medium size yellow balls with 2 holes representing Sulphur, 10 small size white balls with one fixed linkage representing Hydrogen,5 small size white balls with one fixed hold representing Hydrogen, 10 small size green balls with one fixed hold representing Halogens, 5 small size brown balls with one fixed hold representing Metals, 25 polythene linkage of different size. 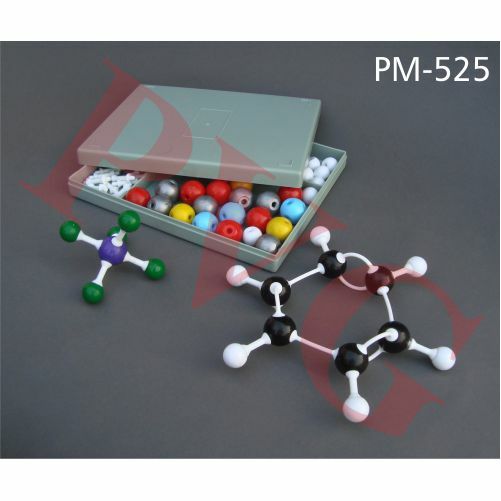 This set comprises of 370 balls of different colors and sizes with 150 flexible connecting white links. 60 black balls, diameter 25 mm., four holes, represent Carbon. 20 Yellow balls, diameter 25 mm., four holes represent Sulphur. 25 green balls, diameter 25 mm., one hole represent Chlorine. 20 orange balls, diameter 25 mm., one hole represent Sodium. 125 white balls, dia.12 mm., with lugs length 50 mm. represent Hydrogen. 185 white connectors, three lengths represent valency bonds. 30 orange balls, diameter 19 mm., two holes represent Calcium. 30 red balls, diameter 19 mm., two holes represent Oxygen. 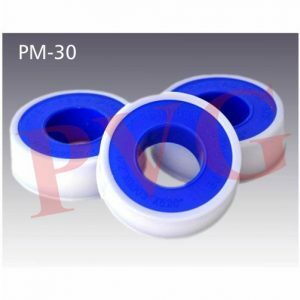 30 blue balls, diameter 19 mm., 15 with three holes and 15 with five holes represent Phosphorous. 30 yellow balls, diameter 19 mm., 2 holes represent Trivalent metals eg. Aluminum, Chromium etc. 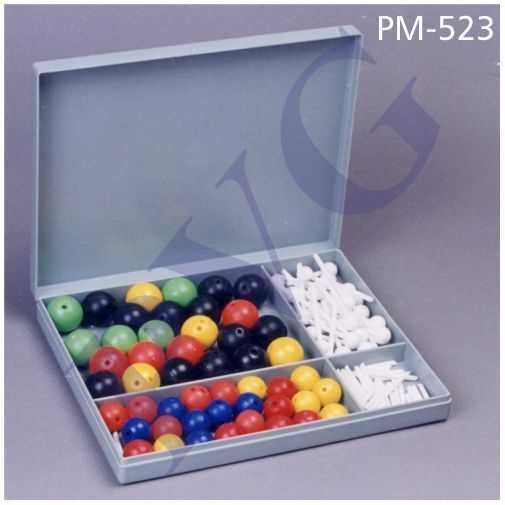 Consists of moulded balls of different colors & sizes along with connectors of different sizes. The sizes and shapes of the balls , connecting lugs have been designed in accordance with internationally acceptable standards. Type………………. Student Set Teacher Set. Std. Glass Filter 8 No. Battery Back up 12 volts. DC Battery Backup. Same as above, mains operated and without Battery Back up Facility. 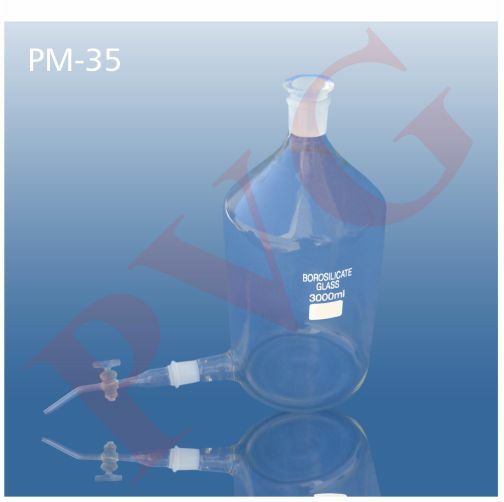 Titration cell Air tight 200 ml. 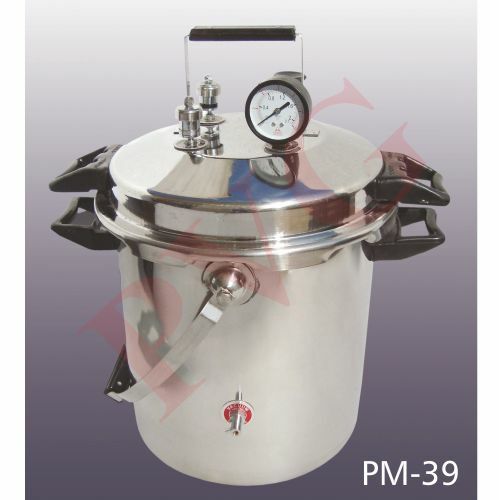 Portable electrically heated, with working pressure adjustable from 5 lbs to 15 lbs/in2, diecast body of high tensile strength aluminium, lid equipped with a spring loaded safety valve of brass adjusted on 15 lbs but can be adjusted to the required pressure by using its chucknut, pressure weight valve set at 17/18 lbs/in2 work automatically if the other safety valve fails to release the excess steam, with pressure gauze 0-30 lbs/in2 and closed by six wing nuts having long threaded screw with bakelite knobs, neoprene gasket do not allow any leakage, lid with a metal handle and a bakelite grip, body with a steam release tap system tube having a bakelite knob at right side which is closed before starting and when opened after completion ensures the contents are dry at the end of sterilization process, fitted with a element 2 kW for heating. Complete with 1.5 meter 3 core mains cable for use on 220-240 V, 50 Hz AC. Dimensions of the inner working chamber – Diameter x depth mm. 300 x 300. 2. Steam release valve with knob. 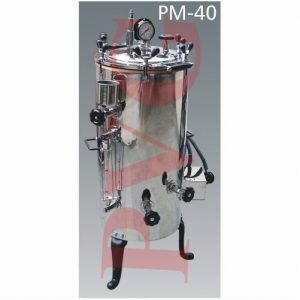 Seamless stainles steel or double walled s.s with safety valve and reinforced bakelite heat resistant handles, safe to operate, with pressure gauze and safety valve level, with a rubber ring gasket fits in the lid so as to make the closure absolutely leak proof. Cat. No. Dia x Depth mm. 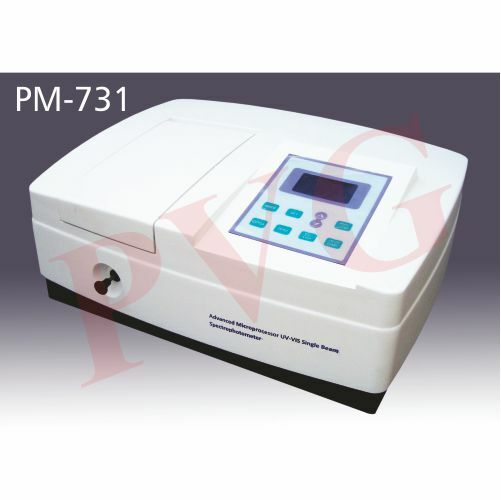 Most versatile, highly reliable incubator for low temperature incubation and routine determination of Bio- chemicals Oxygen demand, for tissue cultures, for preservation of vaccines, insulin, liver extracts, chemicals, for enzyme testing etc. Sturdy, triple walled construction, insulated with thick blanket of fine glass wool between the intermediates and exterior wall to prevent heat loss which forms the main structured. Outer casing is of mild steel finished in white stove enamel. Inner chamber of thick anodized Aluminium sheet or stainless steel with support positions for three shelves, of anodized aluminium or Stainless steel. Lock and key arrangement the front double walled door. Fitted with a door operated lamp for illumination inside the chamber. Temperature ranges from 5°C above ambient to 50°C adjustable at any desired point by means of a high precision double action thermoregulator with in the variation of ±1°C. Unit also provided with a air circulation fan to keep the temperature uniform inside the chamber. For lower temperature work a hermetically sealed, high performance cooling unit compressor is provided at the lower portion of working chamber. 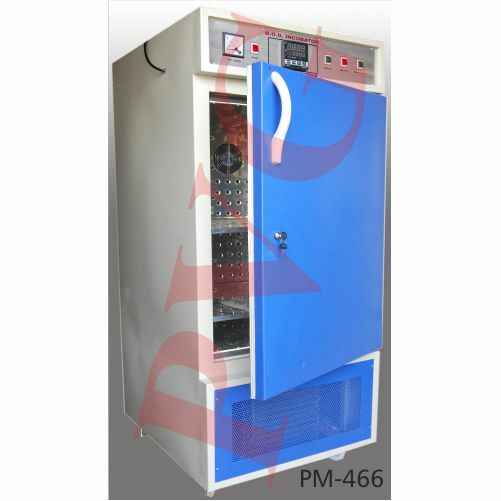 Heating arrangement is made in the inner chamber to work at higher temperature. 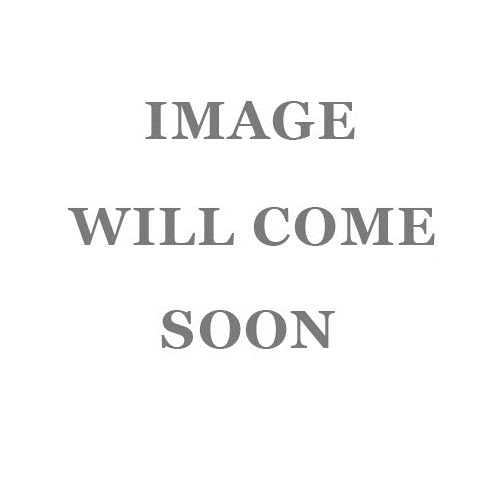 Nichrome wire heating element. All controls and circuitry are housed at the top of the incubator and therefore protected from spillage. Panel given with toggle switch, thermoregulator which allows the user to select and set temperature at any desired level, indicating lamps, a voltmeter on the panel to read the incoming voltage and to read temperature L-shaped prismatic thermometer is provided at the top of front door. 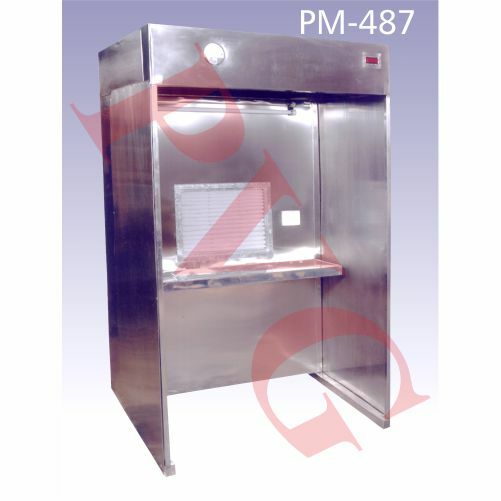 A safety cut out is provided which switches off the heaters in the event of failure of normal temperature control system to protect the specimens from excessive heat. Supplied with 1.5 m. three core cable to work on 220 V 50 Hz AC. Automatic Voltage Stabilizer 3-5 kVA. Flexture free, short armed, brass beam with 100 uh jnV shaped machine notched graduations on its upper edge with 0 at the centre; fitted with optically true, selected agate knife edges and planes, equipped with rider carrier, accuracy adjustable. A variation in the weight by 1 mg. deflects the pointer to 5 scale divisions on the index scale, each half scale division represents 0.1 of a mg. Capacity 200 gm., sensitivity 0.1 mg. Supplied without masses. Capacity 3110 gm., sensitivity 0.1 gm. Mild steel stand fixed on sunmica pasted wooden platform of size length x breadth 480 x 245 mm. ; with four levelling screws. Three graduated engraved beams, first and second aluminium beam graduated 0-10 x 0.1 gm., 0-100 x 10 gm. and third nickel-plated brass engraved 0-3000 x 100 gm. Each beam with a non-removable weight. Zero adjusting device on the left hand end. Single removable stainless steel pan of diameter 210 mm. Dimensions: Length x Height 500 x 520 mm. As above but sensitivity 0.2 mg., a variation in the weight of 1 mg. deflects the pointer to 3 divisions on the index scale.